I wanted to write you and tell you how wonderful she is doing. She has been potty trained thanks to you from the day I brought her home and sleeps all night in the crate. She is amazing. Everyone asks where I had gotten her from. The groomer can't believe at how well behaved she is while being groomed. Everyone we see comments on what a beautiful puppy she is. She is so sweet,loving,laid back, gentle and so smart. She couldn't be a better fit to our family we love her so much. I talk about you all the time about what a great breeder you are and how beautiful you dogs are. I am excited for Bia and Halo and look forward to seeing your postings of the new puppies. Take care and thank you again. I just want to express my gratitude to you and your husband for such a wonderful job you guys do breeding these special dogs. since acquiring Charlie on February 17th 2012, my life has changed completely from the joy and happiness that he has brought to me and my family. Charlie was born December 24th, 2011. He has had no illness and I was able to house train him in 1 month. all he wants to do is get my attention. I'm looking to get a brother or sister for Charlie. I will not buy a dog from any other breeder except you guys. Thanks for breeding these special dogs. 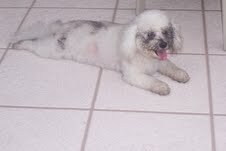 *To all those who are looking to get a Bichon, please don't look to any other breeder but right here. These dogs are well bred and are kept in a very clean house. I'm sorry that you haven't heard from us, but a couple of weeks after I last spoke to you I was diagnosed with lymphoma cancer. It's been a little challenging since then but I've had a lot of prayers and support to help me through. It's going to be a long battle but little did I know that when we got Farina that she was going to be my therapy dog. :) . What a joy she has been!! I can't tell you how much fun and laughter she has brought all of us. She became a part of our family from the beginning, as if it was meant to be for us to have her. And she's even potty broke (knock on wood)! We have her in puppy training classes and of course she is a star. She is so smart and she knows how to wrap us around her little paw! We hope all is going well for the both of you! Thank you sooo much for giving me such happiness and hope. loves her walks where she meets other dogs. So we are very happy with her. She has taken to grooming quite well and now lies quietly while being brushed and combed. She got her first real bath today and it wasn’t too bad either (see attached post-bath picture). Thanks for your periodic check-ins with us over the past month. Your advice is always welcomed. Wanted to send you a picture of our boy after his first haircut. He is just a doll stealing everyones hearts. He is doing quite well and we are crazy about him. 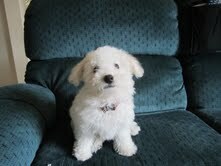 Never dreamed we would love another bichon as much as we loved Bailey. I guess that just shows the hearts capacity to love. By the way he sits up just like Bailey did. We didn't even have to teach him. 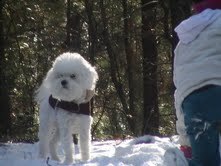 Again we are so blessed to have found The Blessed Bichons and thank you and your family for getting boy off to a good start. By the way, he got an excellent report from our vet. We go back next week for his final shots. Have a wonderful spring and keep raising those wonderful little blessings. Hope by the time you read this everything is going well. It's been almost a year since we last saw each other. Alyson is doing good, we still fighting the tumor, but she is stable, Thanks to The Lord. Brooks is doing awesome, we love him so much. Yes, he is very spoiled....guilty of charge. Just want to let you know how he is doing. I will send some pictures of our baby boy for you to see and share if you want to. Thank you do much for our boy, he surely had brought so much happiness to us all. The drive home was unbelievable! The boys slept the entire 3 hours and twenty minutes. so they woke up at 2:00 am. I took them outside one at a time and back in their crates and they went back to sleep. We had their crates in our bedroom. The boys woke up this morning at 6:00 am. As happy as to puppies can be! They ate their breakfast, played hard again and now they are sleeping. We ALL Love the boys! Looking forward to many years with them. adorable and we are so excited we can hardly wait. 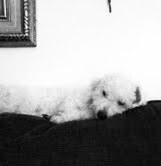 Thanking God for leading us to The Blessed Bichons and you have a blessed day! day every one loved her. Annie on the obstacle course- she went up n down the ramp without hesitation. She was so brave!! She is such a star!!! We were impressed with you all; even the German Shepherd pups were so well behaved and were the best looking we've ever seen. Kudos to you. And to see that you a had a placque in your living room with "Jesus" on it. That was important to us. God bless you. Thanks for letting us take Miss Maggie home with us - she's our music and joy! 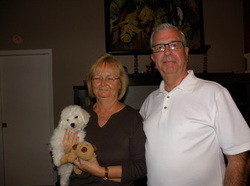 Blessings, Bill & Claudia P.
Teddy is doing great!! Very spoiled :) but we love him we have tons of photos. I saw you ad in the Clermont News Leader and toured your website. Very nice. 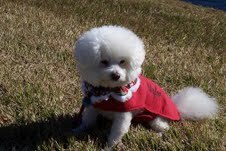 My wife and I have an 11 year old Bichon registered as Annie Kay.She has always been a delight and is the Queen of the house. My wife has COPD and this is about the only breed we can have but would not want another breed anyway. 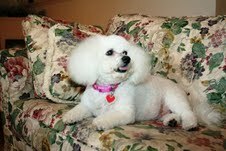 This Bichon causes her no allergy problems whatsoever. Stacy, I’m sorry but I have to send you one more picture. 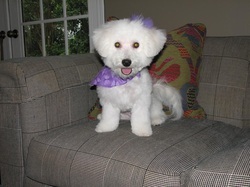 You can tell your clients that Bichons are not always queenly. ** They know how to have fun too. No more pics, I promise. Notice all the toys and look at what she chooses to chew. In this picture she is on the outside of her den area and I was playing with her. You have to love her! Cassie should follow in her father's footsteps. As you can tell by this photo, she should be a star. Her personality is very strong when she is inside with me alone. When we go out and about the neighborhood, or to a dog park, she is by far the cutest and BEST behaved dog there. Everyone loves her, but no one more than me. She is friendly to all other dogs, big or small, and people. She is a very special little puppy at nine months old. People come to visit me just to play with Cassie. It was so nice to finally have a chance to meet you last Friday. We just fell in love with all of your puppies. But as you know, the one that will have a special place in our hearts is the littlest boy. It was wonderful to have the opportunity to see all of the puppies together. 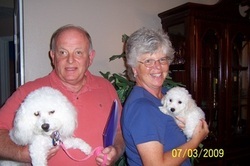 We were very impressed over their surroundings and your great care and love for all of your dogs/puppies. Thank you again Stacy for giving us the chance to meet Riley. This is a beautiful photo of Mufee on her 14th birthday, 12/28/10. God does answer prayers!!!! Both my husband and myself have cried for the past 35 days about our beautiful little Mufee, but now he has sent you to me to become parents again and love someone just like we loved her. I know she can never be replaced, however, this is the sign I've been waiting for....she is sending us a new baby, and she knows how deeply we want her. I do believe in miracles. Cassie has already brought laughter to my brother- in-law who suffers from Alzheimer's disease. He is a wonderful man. Thank you for doing such a beautiful job raising this little pup. I am sure she misses your family. I will love and care for her without reserve. Please thank them for me and I promise you Cassie will serve the Lord in her own little way. Our church sponsored a Hearts for Paws event with the proceeds going to the local Humane Society. Our Pastor blessed all of the pets and thought you would enjoy a picture of Annie's blessing. She had a really great day every one loved her.